If you’re paying a facilitator, you must have something difficult to deal with and you need something different to happen. We like to work at edges, to find ways to break conventional patterns and help people see things differently. We like to have fun and bring an attitude of playfulness to even the most serious topics. Fun is not the same as trivial, nor is it endless icebreakers. Serious issues can be discussed in creative ways. Being solemn is a way of avoiding risk and staying stuck. We expect to work on challenging, stressful issues. But we aim to do so with a sense of ease. Breakthroughs don’t happen on a schedule and people burn out if they are in a constant rush. We consistently get feedback that we are good at pacing meetings to keep people interested and creative. Great facilitation is nearly invisible and while we will be responsible for creating a safe and workable space and setting up activities, the work itself will be done by the participants. We are not TV presenters and we aren’t interested in being the star of your show. If your measure of success is lots of information on post-it notes, and written into a detailed report, we’re probably not the facilitators for you. People remember experiences, not content. Great arguments and rhetoric don’t change peoples hearts and minds, or the way they do work. Experiences do. 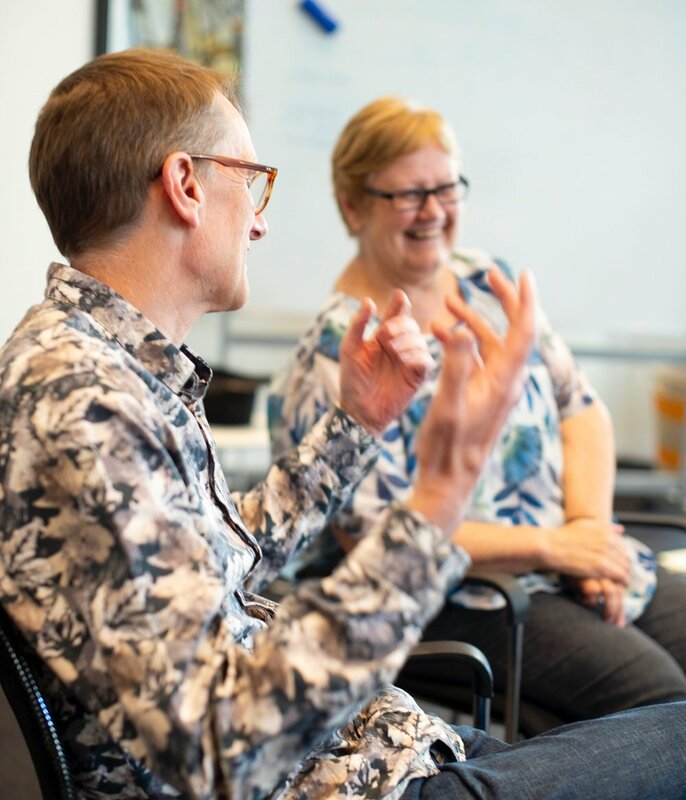 Our workshops are full of experiences to move people from “what?” to “ah-ha”. We want events to be engaging and purposeful. To make this happen, we want our attention on the people in the room and what’s happening live, not a sheet of paper worked out in a darkened room two weeks before. We’re wary of over-detailed minute-by-minute session plans. Smart participants don’t give their best when they’re constrained too tightly. Some of our events are quite conservative while others are more playful and theatrical - Johnnie once helped stage the haunting of Arundel castle, and Viv staged an event called Live and Earthy which people are still talking about decades later.